Delicious & Sons, a new brand of authentic, easy to use Mediterranean dips, spreads, glazes, sauces, oil and condiments, will introduce its line to the specialty food world at the 2017 Summer Fancy Food Show at New York City’s Javits Center from June 25-27. Attendees can sample all 17 of the products -- which are USDA-certified organic, all natural, non-GMO, gluten-free, and certified vegan and vegetarian -- at the Delicious & Sons booth (#4914) throughout the show. Monica Navarro and Ricky Mandle, the husband and wife team behind the growing company, have deep roots in the international specialty food world, and they created Delicious & Sons last year to bring an authentic taste of the Mediterranean to American kitchens. The mission of this brand is to normalize the idea that incredible food products can, and should, be responsible, ethical, and enriching, whether used on a busy weeknight or around the holiday table. Using traditional ingredients that are sourced at origin in Italy and Spain, Mandle, who is a trained chef, developed each product’s recipe with the home cook in mind, making them clean, easy to use, and accessible for all diets and palates. This Mediterranean condiment has been updated for today’s tastes. Rediscovering the traditional, centuries old Catalan recipe, our unique egg-free aioli, one of the few egg free and vegan certified aiolis on the market, includes a garlic base, aromatic oranges, and touch of delicate saffron, and it is ready to spread on sandwiches, meats, and veggies, or is perfect as a dip for French fries. This aromatic and refreshing ready-to-use basil aioli transports you directly to the Mediterranean. A modern interpretation of this authentic Spanish sauce, with our unique egg-free recipe, combines basil and refreshing lemons that dresses up any dish, from grilled meats and roasted veggies to sandwiches and French fries. Made from real balsamic vinegar from Modena, this luscious balsamic glaze is one of the few organic glazes on the market. Drizzle it over savory dishes like salads, vegetables, cheese, fish, meats and chicken, or even try it on sweet items like ice cream, yogurts, and fruits. Our Balsamic Glaze with an intense white truffle aroma adds earthiness, sweetness, and tons of flavor to savory dishes. This glaze adds a vibrant zing to whatever it’s drizzled upon. Extra virgin olive oil with black truffle authentically sourced in Umbria, Italy, has an intense aroma and a golden color. This gourmet black truffle oil invites you to travel to Italy without leaving home to enjoy this most prized culinary delicacy. A drizzle of black truffle oil elevates any dish to the extraordinary. Following the traditional recipe, this mushroom tomato sauce is made from organic red tomatoes ripened to perfection under the Mediterranean sun, aromatic porcini mushrooms, and extra virgin olive oil. This sauce pairs beautifully with stuffed pastas like ravioli and tortellini, or inside lasagna and eggplant or chicken parmesan. Flavorful, organic red tomatoes ripened under the Mediterranean sun combine with green & black Italian olives and extra virgin olive oil for a bold, semi-sweet pasta sauce. Try this sauce with chicken, fish, or within any meatball recipe. This is a tomato sauce typical of the south of Italy, with just enough heat to please all palates. Flavorful, vine-ripened tomatoes combine with capers, anchovies, fresh herbs, hot chili peppers, and extra virgin olive oil. Perfect with any long-cut pasta (linguine, spaghetti, fettuccine) or cooked up with fresh veggies. Authentic and aromatic Italian black truffles combine with rich, earthy mushrooms and extra virgin olive oil to produce this intense truffle sauce. Opening the jar of this sauce carries you away to a Tuscan hillside and the sweet breeze of the Mediterranean. It is perfect in pastas or on top of meats, fish, and veggies. This spicy olive tapenade spread is made from Spanish black olives and extra virgin olive oil, producing an intense aroma and flavor. Great combined with cheese, veggies, or simply spread on a piece of crusty bread. This sweet and salty spread is made by combining authentic black olives from Aragón with honey and extra virgin olive oil, producing an intense flavor with a touch of sweetness. Try it atop foie gras for a unique flavor profile. Made from organic Italian tomatoes and extra virgin olive oil, this sun-dried tomato spread is ready-to-use atop grilled meats and fish, as a base for many sauces, or a dip for crudités. Similar to Baba Ganoush, this gourmet spread is great as a dip or a base for creamy pasta sauces, combining fresh eggplant with extra virgin olive oil, fresh herbs, and Italian green olives. Smooth and subtle, this artichoke dip made with extra virgin olive oil highlights flavors of red pepper and capers alongside a creamy artichoke base and is delicious as a dip for crudités. Very aromatic with a smooth texture, this mushroom dip made with extra virgin olive oil is ready-to-use and enjoy on sandwiches and crackers, as well as accompany salads, meats, chicken, and fish. A classic basil pesto sauce blends organic basil grown in Liguria in northwestern Italy, DOP Parmigiano Reggiano cheese, and organic Italian pine nuts, creating the most authentic and best tasting Pesto Genovese, known simply as “green pesto,” on the market. It pairs well with an infinite number of dishes or can be simply enjoyed with a piece of crusty bread. Flavorful, intense, and incredibly smooth, this sun-dried tomato pesto sauce is not as well known outside of Italy, but it is as authentic and traditional as green pesto. We use organic basil grown in Liguria in northwestern Italy, organic sun-dried tomatoes, and DOP Parmigiano Reggiano cheese to create the most authentic, and best tasting sun-dried tomato pesto rosso on the market. Try it with grilled chicken or paired with pastas or summer salads. Delicious & Sons products are available for purchase in supermarkets and specialty food stores around New York City and online in the brand’s webstore or through Amazon. For more information on Delicious & Sons’s line of products, visit http://www.deliciousandsons.com, or stop by Booth #4914 at the Summer Fancy Food Show. Stay up to date with the brand and join the conversation on Facebook, Twitter, and Instagram. Delicious & Sons is a Mediterranean food brand created by founders Mónica Navarro and Ricky Mandle, of Barcelona-based and internationally awarded brand Delishop. Delicious & Sons was created in accordance with today’s market, satisfying consumer’s desires for a gourmet product that is also organic, all-natural, non-GMO, gluten-free, vegan and vegetarian. 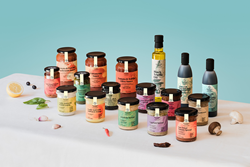 The product line currently consists of 17 different sauces, spreads, and olive oils, created with authentic recipes and produced in place of origin. Delicious & Sons is a brand for almost all eating habits and lifestyles, offering healthy and natural products with superbly attractive packaging. For more information, please visit http://www.deliciousandsons.com. The product line’s packaging was created in collaboration with Clase bcn, one of the top agencies for packaging design in Barcelona. The final design represents some of Delicious & Sons’s core values, including a sense of closeness, honesty, and dedication to the joy of the Mediterranean eating experience.